There is a place in Palermo so rich in history and atmosphere. We are talking about the Foro Italico, the promenade overlooking the monumental complex of Palazzo Butera, with its Mura delle Cattive (where bad women used to stroll). Here right next to the Palchetto della Musica, is located Le Mura Lounge, a place open only a year and a half ago but already with a determined character. 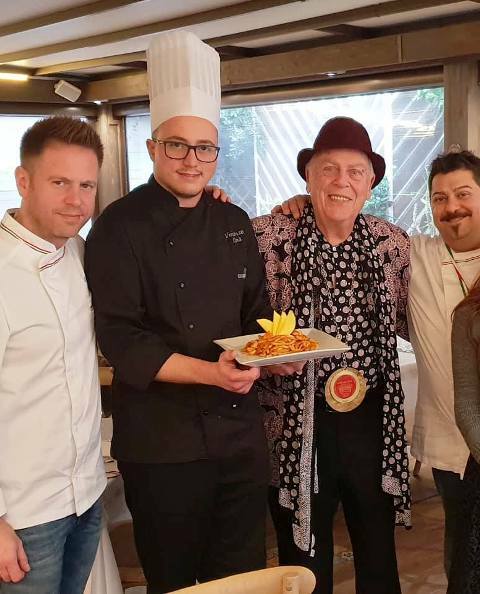 Considering the place, the restaurant proposes itself as a typical Palermo cuisine, but with a touch of refinement more thanks to the young chef, Vincenzo Cinà (in the center in the picture). In winter you can eat in the veranda and in the summer in the outdoor area, looked after by the very young maitre, Emma. It’s so pleasant, to discover all this energy and capacity in renewing, which are due to young people in Palermo, able to make feel new and exciting ancient places and ancient flavors, revisited by a sense of future and novelty. In Sicilia l’importantissimo meeting di Google.